Four tips from University of Michigan Men’s Basketball Strength Coach, Jon Sanderson, that have again contributed to their late season run. For the casual fan, the crescendo toward a National Champion and One Shining Moment makes March Madness one of the most exciting times of the year. Cinderella teams, busted brackets, and the game-winning buzzer beaters are just the icing on the cake for one of sports’ greatest spectacles. Those of us who work in the game coaching and training athletes feel that excitement as well, but also recognize the mental and physical requirements of competing at such a high level. Being ready for both the expected and the unexpected is a necessary part of gaining an edge and earning success for programs at all levels. There is a lot that has gone into Michigan’s late season success – winning 12 of their last 14 games. Much has been said about the plane crash en route to the Big Ten Tournament. And of course the X’s and O’s of Beilien’s magical offense. 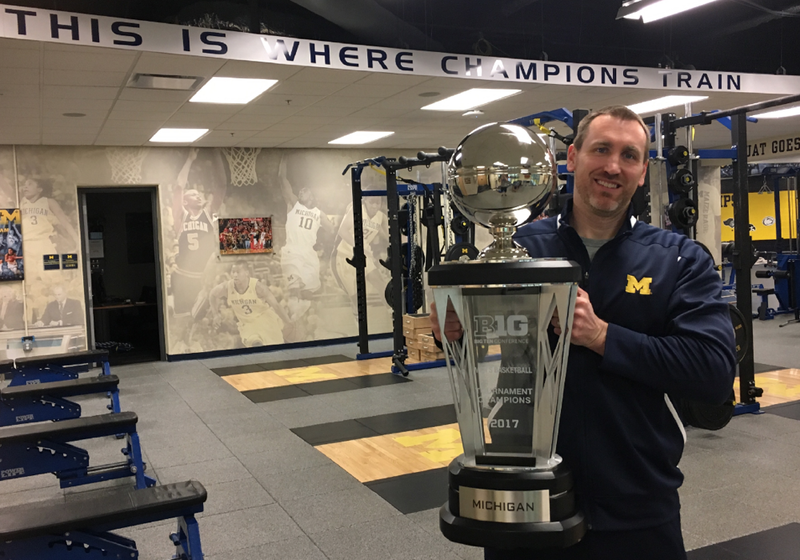 But behind the scenes there has been someone else hard at work Jon Sanderson is the Head Strength and Conditioning Coach of the University of Michigan Men’s Basketball team. Physical and mental toughness is built in the weight room and Sanderson is one of the best in the business. He has proven time and again that he can develop athletes mentally, physically, and have them ready for post-season play. Preparing through stretching and mobility exercises is a vital component of maximizing performance, building strength, and fending off injury. In his work as trainer, Jon recommends a specific set of stretches and other activities such as foam rolling that focus on preparing key areas of the athletes’ bodies. It is likely that your program already has a routine. Chances are you could also take a page out of Sanderson’s Basketball Strength and Conditioning Book and help prepare your team for success by introducing new and beneficial activities. The routines he recommends are tried and true, and have produced champions at the D1 level. The faster our athletes’ bodies can heal and rejuvenate after competing, the sooner they can perform again at their highest level. The use of cold tubs and contrast baths help to maximize circulation and speed up the body’s own healing process. Granted, not all programs have facilities or equipment to allow for full immersion. The principles, though, remain consistent and are applicable no matter what your circumstances. Cold tub immersion is beneficial because it reduces inflammation and pain. A common misconception is that it needs to be ice cold water. Jon recommends filling a large container with water between 50-60 degrees F, and having the athletes submerge their bodies for between 8 and 12 minutes. The result of this treatment will be faster recovery after intense physical output. Contrast baths are also immensely helpful for reducing pain, increasing circulation, and helping the body to flush out lactic acid – the culprit of sore muscles. Have your athletes alternate start with the hot tub (or large container of hot water) of 100-103 degrees, and finish with the cold tub at between 50 and 60 degrees. Three rounds of 3-minute immersions each will encourage faster healing and pain reduction. It’s often overlooked as a component of preparation, but getting enough sleep is essential for peak mental and physical performance for athletes. Studies have shown that 8-10 hours is optimal amount of sleep for the high school age group to get each night. The benefits of adequate sleep for athletes include improved reaction times, reduced injury rates, longer playing careers, better accuracy, faster sprint times, and fewer mental errors. In other words, if you want your individual athletes firing on all cylinders, help them to understand and achieve the right amount of sleep. Eating right can be a tall task in today’s fast paced world—particularly for student athletes. Sometimes it’s easier to grab fast food or snacks that are high in sugar but low in nutritional value when it matters. Helping our athletes to regularly make smart decisions in how they fuel their bodies can pay off on the court immediately, and result in better energy, endurance, and overall performance over time. It will also lay the foundation for better nutritional habits, a longer playing career, and healthier overall lifestyle. What’s not to like about that? Jon provides details on recommended nutritional habits in his book, but just encouraging your athletes to make better decisions is a great first step in the right direction. When you boil it down, Jon Sanderson is an expert in preparing athletes to compete at the highest levels. The tips mentioned here are just a few of the things he recommends for athletes off the basketball court, and are things that you can apply to your own team. If you would like more tips and best practices on preparing for success, here are two great ways to go about it. You can get Sanderson’s Basketball Strength Workouts through MaxOne. The cutting edge coaching app provides you with video instruction and a platform for tracking athlete performance, and helps you lead a better program. Click here to learn more about Max One. Read Jon’s book: Basketball Strength and Conditioning: Above the Rim with Camp Sanderson. This book covers all areas of training basketball athletes including strength, power, speed, conditioning, mobility, nutrition, and much more. It also provides sample workouts and many diagrams to help coaches and athletes start implementing what they learn into their own workouts. Use code MM and get 30% off!